Erskine Caldwell and the Great Banana Uprising of Dunedin, Florida. The author of “earthy” novels that dealt with poverty and race relations gave him worldwide acclaim but (for a time) a cold shoulder in his native South. This story is adapted from his autobiography: With All My Might. Caldwell was a Georgian who could be described as a compulsive traveler. His popularity reached such far-flung places as Russia, Turkey and Japan and his works have been translated into over 35 languages. His hometown of Moreland, Georgia has opened a museum on the town square in his restored and relocated boyhood home. After leaving wet and damp coastal California, Erskine, with his fourth wife Virginia, moved to Dunedin, Florida, a coastal community just north of St. Petersburg on the west side of the peninsula. One day Virginia saw a contractor pouring a concrete slab for a new house on a one-acre lot. She asked the man if he’d be willing to build to her specifications and he agreed on the spot. As they settled into their dream home, it became apparent that landscaping was needed. After planting a hedge of viburnam which had to be trimmed almost daily, Mr. Caldwell spied a grove of banana plants that was being cleared to make way for a new shopping center. He quickly dug a “tubful” of of the endangered roots and transplanted them into his backyard during a downpour. Within a week the sprouts were growing faster than Audrey II on Miracle-gro. He tried to interest his neighbors in an adopt-a-root campaign, but being his neighbors, they had seen the drama unfolding and decided they “didn’t want to become involved.” He implored old friends to take a few tub loads of roots. Even his book loyal distributor declined to help. 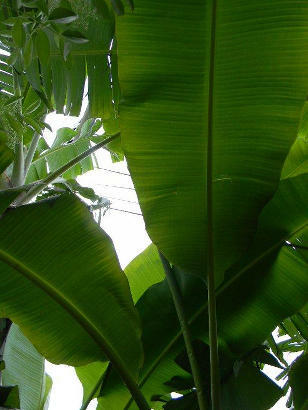 Caldwell was shocked and saddened when his old friend “refused without even an apology” to foster some banana plants. Because of a book tour in Europe, Caldwell asked his “friendly nurseryman” to make the bananas go away while he was gone. He returned to find his acre of land with twice as banana plants many as there were before he left. Nurserymen are not above saying “I told you so…” and Caldwell’s man did exactly that. After saying he should’ve been consulted before the plants were even adopted, he gave the author two choices: “bring in some heavy earth-moving equipment and end up with a hole big enough to bury all of the elephants in the circus” or wait until someone wants to build a parking lot on your property and “choke the cussed bananas to extinction.” Today no one in Dunedin seems to remember Erskine Caldwell. Even the city librarians (who have heard of him) are only mildly surprised that he once lived here. Local bananas have settled down and no longer pose the threat described in Mr. Caldwell’s autobiography. *Mr. Caldwell died in 1987 from lung cancer and complications of emphysema (it seems the California doctor’s diagnosis wasn’t incorrect after all). He had left Florida and spent his last years in Arizona. He was buried in Oregon.